Substations generally have switching protection, control equipment, and transformers. In a large substation, circuit breakers are used to interrupt any short circuits or overload currents that may occur on the network. Smaller distribution stations may use recloser circuit breakers or fuses for protection of distribution circuits. Substations themselves do not usually have generators, although a power plant may have a substation nearby. 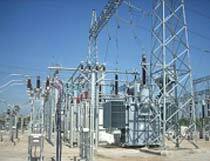 Other devices such as capacitors and voltage regulators may also be located at a substation. In sub station normally Current transformer, Potential transformer, Lightning arrester, Isolator and L and E switch, Post insulator structures and Gantries are used.